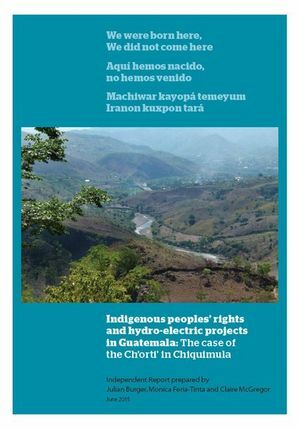 An independent report is now available on the human rights situation of the indigenous Ch’orti’ communities in the Chiquimula region of Guatemala. The report was prepared by an expert legal delegation on the request of Guatemalan NGO Nuevo Día, which informs and supports rural communities on issues relating to the rural economy and environment. A large part of Nuevo Día’s work involves providing support and legal representation to Ch’orti’ communities who are opposing the construction of hydroelectric projects on their ancestral land. "The failure to recognize and respect Maya Ch’orti’ collective rights to their land and to be consulted with regard to the use of natural resources on their land is at the root of the conflict unfolding in Chiquimula"
The communities claim that plans to build a series of hydroelectric dams on the Jupilingue river will affect their livelihoods and threaten their way of life. The community’s protests have led to conflict with the local authorities and the criminalisation of community members, in a stalemate that has lasted seven years. During 2014 Nuevo Día, which has been accompanied by PBI since 2009, reported an alarming escalation of threats and attacks against members of the organisation and the Ch’orti’ communities, highlighting the need for an independent body to investigate the human rights impact of the proposed dams. The delegation visited Guatemala in May 2015, facilitated by PBI UK with funding from the Open Society Foundations. It was composed of Human Rights professor Dr Julian Burger and barristers Monica Feria-Tinta and Claire McGregor, all experts in the fields of indigenous peoples’ rights and corporate social responsibility. During their time in the country, they met with a range of actors relevant to the conflict, as well as other organisations able to inform their understanding of the underlying issues. The final report (available here) concludes that the Ch’orti’s collective rights as indigenous peoples, as guaranteed both by Convention 169 of the International Labour Organisation and Article 67 of the Guatemalan Constitution, have been violated by the failure to adequately consult the communities prior to the approval of the projects. It goes on to make a series of recommendations on how the companies and the Guatemalan government can strengthen the community consultation process and ensure the undertaking of an independent social and environmental study on the impact of the dams. It also recommends a national review of legislation and policy to ensure that government practice regarding indigenous rights is in line with international law. The report advocates urgent action to implement these measures in order to prevent further deterioration of the human rights situation of the Ch’orti’ communities. The measures are also considered crucial for reducing social conflict in the country more generally and creating conditions for responsible business and investment that respect the rights of indigenous peoples to self-determination.